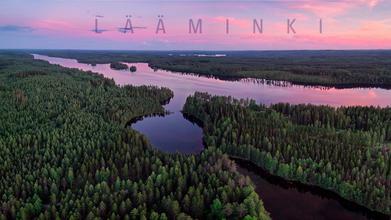 Lake Laaminki sits in southern Finland, near the town of Kangasniemi. The forest surrounding the lake is what one would picture in a postcard for Finland, thousands of acres of pine trees under a crystal clear sky. Contributor Timoksanen flew his Yuneec Typhoon drone over this magnificent bit of Scandinavia and produced this amazing aerial video of an iconic Finnish lake and forest scene. The proverbial icing on the cake is the magnificent pink sunset. Description: Summer day sceneries from sunrise to twilight after sunset. Shot in the end of June and beginning of July at lake Lääminki in Kangasniemi, Finland.